In the bowl of a stand mixer, cream the butter and sugar. Add the egg and the vanilla and beat until well combined. In another bowl, add the flour, baking powder and salt, mix with a fork until combined. Add the flour to the stand mixer and mix until the flour is just incorporated into the butter mixture. Form into a disk and wrap with plastic wrap. Refrigerate until cold, about 1 hour. It is important that the sugar cookie dough is cold or the cookies will spread too much during making. Once the dough is chilled, roll out and cut into 2 inch circles (or just larger than the base of your strawberries). Bake at 350 for 8-10 minutes or until the edges just barely start to brown. It will probably look as if they need another minute or too, but cookies continue to bake once they are out of the oven and you don’t want these to be too crispy. In the bowl of a stand mixer, beat the cream cheese on high for about 2 minutes. Add your room temperature butter and mix until combined. Add the vanilla and beat again until combined. Turn the mixer off and add the powdered sugar, return mixer to a low speed and mix until the sugar is incorporated into the cream cheese. Add the frosting to a piping bag. If you don’t have a piping bag, add to a large, heavy duty, zip lock bag and cut about 1cm off the bottom corner of the zip lock bag, this can be used as a make-shift piping bag. Pipe a dime sized amount onto the cut end of the strawberry and place in the middle of your sugar cookie. 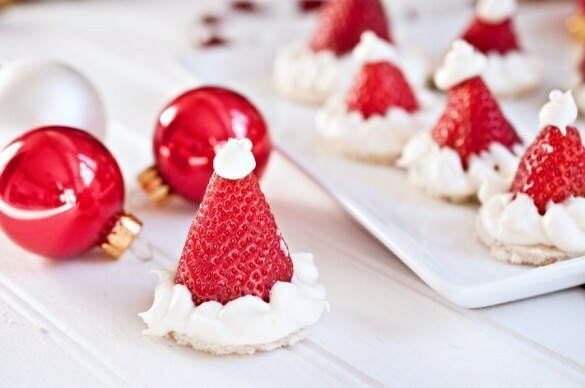 Pipe the frosting around the base of the strawberry, as well as a pea sized amount on the tip of the berry to resemble Santa’s Hat.